Looking over some of the decklists from Pro Tour: Khans of Tarkir, there was one that really stood out to me and that was the Red/White Heroic build piloted by Yoshihiko Ikawa of Japan.It was very similar to the deck I took to the last Gameday for Magic 2015. 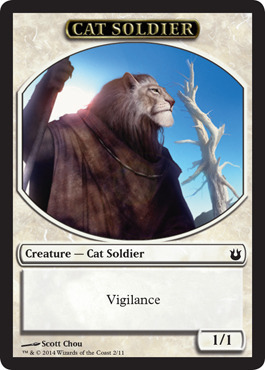 The card choices are solid and I like the White Weenie feel the deck has to it. None of the Red spells are burn spells, They are all in there for the little value they provide the deck. Akroan Crusader for one, gives you a small supply of hasty 1/1’s early on and even gives you more value when Launching the Fleet. The other red card, Dragon Mantle, is surprisingly good. I believe older builds of this Boros-style aggro deck mostly ran some Ordeal of Purphoros and even Ordeal of Heliod. Thos took a while to pay off and didn’t ‘cycle’ like Dragon Mantle does. It is also an efficient mana sink for when we want to grow our little enchanted threat into a menace that needs to be blocked, thus almost doubling as a removal spell. 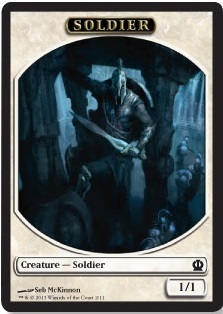 I was also impressed at the lack of Khans of Tarkir innovation in the deck. 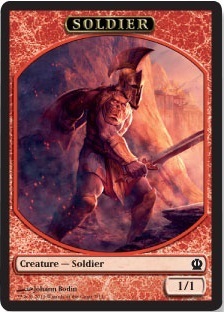 Defiant Strike is the only KTK card in the maindeck. It does in fact look rather unimpressive in a vacuum, but it makes this deck work soooooo much better. Cantrip, trigger Heroic and pitch in on offense for one white mana? Sure, anytime! It makes it seem even more like this deck is mostly made up of draft deck leftovers. You can probably pick up most of the nonland main deck cards for under 15$. The manabase is a different story though, it can ran you over 100$. To be fair, you can probably replace the 4 Mana Confluence for a few basics and not notice too much of a change if you just plan to play this at a local FNM (which I highly recommend you try).You can do silly things like cast Obelisk of Urd on turn 3 and then be attacking for lethal the next turn with a Launch the Fleet. All the creatures either are soldiers or produce soldiers. Another interesting fact is that they are not all the exact same token so a Bile Blight won’t completely ruin your day. The sideboard is pretty tight and you’ll often find yourself having trouble siding out stuff. I really like the fact that some of the removal from the side can also double as combat tricks when you have a Phalanx Leader in play. Devouring Light can randomly bolster your troops and deal that final few points of damage for almost no mana or actual 0 mana (provided you have enough vigilance creatures in play). The same can be said to a lesser extent for Glare of Heresy or Suspension Field. Purphoros can be sided in versus decks that tend to be more controllish. I kind of like the Dawnbringer Charioteers versus decks like Jeskai or red-based aggro. You never really need to Heroic it to have it make a difference. It blocks cards like Mantis Rider really well and is just plain cool with a Dragon Mantle on it. Kind of like a ghetto Baneslayer Angel.